From 7th July to 7th August 2015 is the sixth month of the year of the Wood Goat (Yi Wei) with the ruling energy of #9 in the central grid. Southeast – Offices or shops with doors that open to this sector may get a lift in business. Expect business opportunities to turn up. However, where health is concerned, especially if this is a bedroom, do practice caution and make sure you have your annual cures in place like the six Chinese coins tied in a row with red ribbon and salt water cure along with metal ornaments or objects. This location can also be good for studies. Students undergoing exams should take advantage of the influences of this area. Make sure that they face one of their good directions when seated at the desk. A task light on the desk will help to keep them focus with the tasks at hand. If you have a crystal globe this is a great place to have this month. South – A mix of good and bad here. Writers should make good use of the benevolent influence of the month if your room is in this part of the house or office. Whilst there are good signs for those in the writing field. As summer sets in, those who occupy a south room are more susceptible to respiratory related problems. Take good care of yourself. You can place some blue items around the area to balance the elements. You should place some romantic symbolic items like a pair of Mandarin Ducks or a hugging couple in the south this month to enhance romance. Southwest – A mix of good and bad in July with Tai Sui here for 2015 and although this area can be very good it can cause family disharmony if this is your kitchen. Be careful of fire risk and take extra precaution with hobs, oven and stove. Rivalry is also indicated. If this is your office, keep a low profile for the month and beware of a challenge to your authority. This latter point applies equally at home as in the office. You can use earth coloured or ceramic objects to calm situations. A good cure here in July is a wooden wu lou. Northwest – This is a great room for those in studies. Students will do better if they use this room for their studies. To further enhance, place a crystal globe on their work desk. If you are in the writing field, you will do well this month if your office is in the northwest sector. Light a task light on your desk for enhanced focus and concentration. Avoid studying in the northeast. West – The west is where the Five Yellow resides and this month we have the #2 star (#5 annual & #2 monthly) so my advice is to avoid it completely. It is of paramount importance that you do not undertake any repair work, renovations, breaking ground or felling trees in this sector this month. If activated, its influence can and will create problems, obstacles, accidents and illnesses for the residents or the business in the office. As you know I do not normally like to recommend a product cure but a Wu Lou, six Chinese coins tied with red ribbon or six rod metal wind chime is very effective here. Use another door if this is your front door. If you have a bathroom or cloakroom here or any room you do not use much this is good news and no cure is necessary. 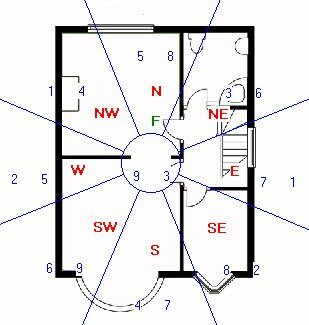 If there are external poison arrows, for example, sharp roof lines, sharp images or unfriendly structures pointing at your property from this west direction, this may bring fire accidents. Place a Ba Gua outside if your main door is located here. North – Although for the year this is a good area in July it is visited by the monthly #5 Yellow. Do avoid any renovation of this room or disturbance of the earth in this corner of the garden for the month. Businesses with a front door in the palace may experience some minor setbacks during the month. If this is your bedroom or office, you can place some metal objects in north corner of the room or place a golden Wu Lou in the north corner of your bedroom if your bed is also located in this corner of the bedroom, especially if you suffer from sinus problems. If you use our monthly cures kit you should place a Wu Lou along with six Chinese coins tied in a row with red ribbon in the north this month, this will weaken the negative earth element this month. My advice is to be very careful with the north in the month of July. Do not undertake any form of renovation, hammering nails or drilling in the wall, or disturb the earth with digging work for ponds, wells or swimming pools. Working with any noisy equipment in this area is also not advisable. Instead of using metal objects, you may also use the salt water cure. If there are external poison arrows, for example, sharp roof lines, sharp images or unfriendly structures pointing at your property from this west direction, this may bring fire accidents. Place a Ba Gua outside if your main door is located here. Northeast – Beware of an increased number of headaches if you are already suffering from migraine or headaches. Make sure you are not dehydrated especially if your office is in this sector of the office premises. The cure is in your own action. Drink plenty of water and take frequent breaks from the computer screen. East – Businesses or shops with a main door or office in this sector, may experience minor setbacks or face additional challenges, stress and even staff problems. Take things in your stride and stay low as this is only a monthly influence and it will pass. Things will look better next month again in August.